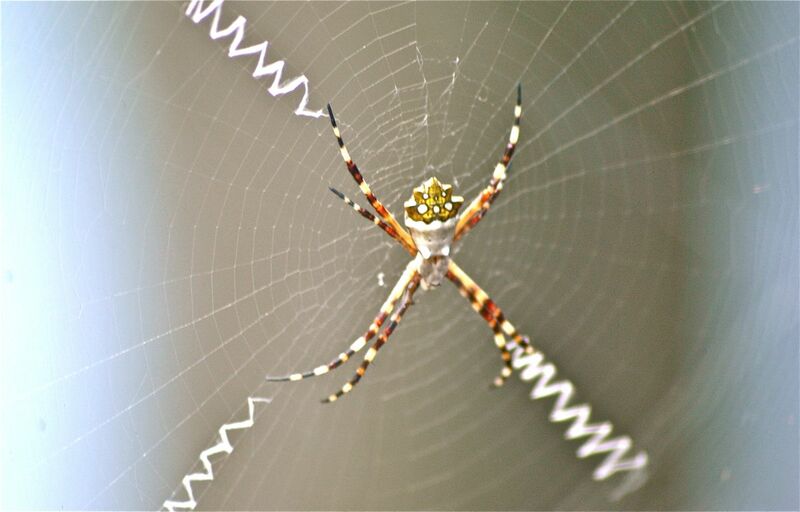 Silver argiope spider, photographed in western Delray Beach, Palm Beach County, in December 2013. By definition, spiders are supposed to have eight legs. But at first glance, this guy, the silver argiope, Argiope argentata, might appear to have only six or even as few as four. Get in a little closer, however, and the full complement becomes apparent. Silver argiope spiders are fairly common in South Florida and generally harmless. A bite from one for most folk might cause a little discomfort but nothing more. The very young or the very old or the very sick can be more vulnerable. Silver argiopes are also found in extreme southern California, Arizona and Texas, ranging through Mexico, Central America and much of South America to Argentina. What you're looking at in all but the picture at the bottom left of this page is the female of the species. Like many spiders, it's the female of the species that attain size. In the case of the silver argiope, the male is about quarter the size of the female and also much duller in appearance. The silver argiopes we've seen have been between one and two inches long, including legs. These spiders a silver carapace — the upper portion of its shell — with a golden yellow abdomen with white spots. The abdomen is almost crystlalline in appearance, like fool's gold. As is common with many members of the Argiope genus, it sits in its web head down, its four pairs of legs spread in an X shape (their Australian cousins are known as St. Andrew's Cross spiders because of this shape). 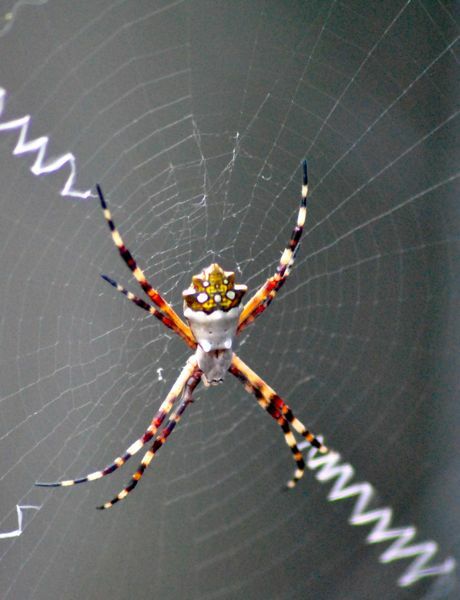 Those zig-zag structures in the web are also typical of genus Argiope. They're called stabilimenta. Their purpose is unclear to scientists but despite the name, it's not believed that stabilimenta actually stabilize the web. 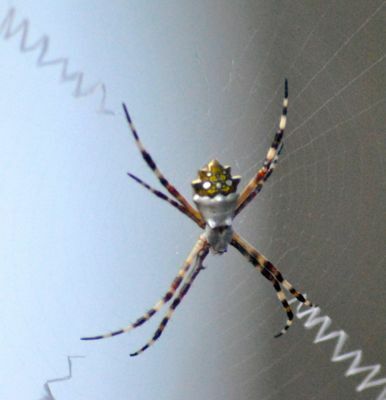 Theories include: they warn birds of the web's presence so they can avoid flying into it, although argiope webs tend to be much closer to the ground than birds usually fly. Another theory is that somehow the zig-zag lines lure prey into the web. Silver argiopes tend to hang on the edges of fields, open woods and in gardens, inspriing a couple of other common names. It also tends to move frequently, building a new web every two days. The silver argiope has a close relative that bears a striking resemblance to it — argiope blanda. According to the San Diego Natural History Museum, the only way to tell the difference is by examining their genitalia. Really. Other names for the silver argiope include silver garden spider and silver garden orb weaver. It is a member of Araneidae, the orb weaver family. 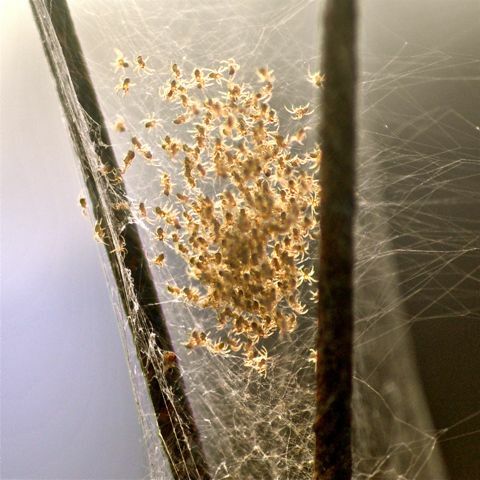 The photo at the left shows a web filled with newly hatched silver argiope spiders.